When You Just Don't Feel Like It! I have not done anything to my hair for almost two weeks. No cowashing, no comb detangling and I kept it in a simple loose bun style during the whole duration. Of course I finger combed, tied my hair up at night, moisturized my hair edges and moisturized the hair ends every other evening. We do have regimens that we follow, but do we really follow it all the time? I will not say that I am 100% consistent when it comes to my hair. I use my regimen as a guide to reference to and cater to my hairs' needs when needed. But for the past week, just as few other times...I just did not feel like being bothered with my hair at all! Some of my reasons are because I become overwhelmed, I am tired after the day is over (kids - husband, household things, work, errands, etc.) and/or I am pushing it for the next day almost every day during that time frame. After I get out of that trance of laziness, I go all out - deep condition and give my hair the TLC it needs. And of course it feels great afterwards...not to mention the relief that it is finally done! Tonight may be the night I finally do something with it *sighs*...LOL. Does anyone else feel this way sometimes? What do you do with your hair during the periods of "laziness" or "neglect"? How has that affected your hair? What do you do with your hair after that long period you didn't do anything? Thanks for reading and I'll keep you posted! Many of you wonderful ladies and some gentlemen have asked me about my hair techniques to maintain the thickness and health. 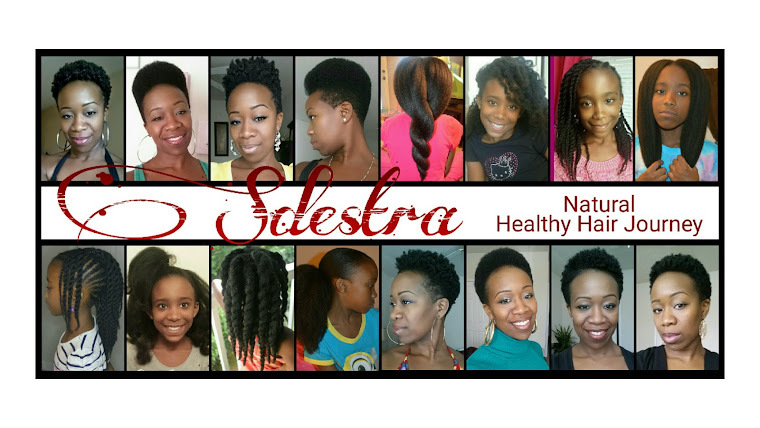 I provided the different healthy techniques that has helped me throughout my hair journey and I hope it helps you too. Although I had a few set backs (post partum shedding, dry colored breaking hair), following these steps helped me get my hair whipped back into shape. Airdry - I airdry after applying my spray leave ins and/or moisturizing leave in. I also tie the front of my hair down to keep the edges flat while the rest of the hair is loose to dry. Protective Styles - Styles that will hide the ends away and help you retain length. My favorite styles are buns, french braids and anything that will keep my hair above the neck. Low manipulation - I try to leave my hair alone. I would style my hair in simple styles such as buns or braids. I basically tie my hair down in the evening and gently use my fingers to redo the style. No need for a comb and as a result, you have less stress to your scalp. Avoid tight hair styles - Tight hair styles will not only give you a migraine, but will add unecessary stress to your hair and scalp. Results to tight hair styles are breakage, weak hair and loss of edges over time is called traction alopecia, something people do suffer from as a result of the things mentioned above. Brushing with a soft brush - I don't brush my hair a lot and do not recommend it either. Brushing with a hard brush can cause more damage in the long run than making those fly aways look slick around the head. Using a hard brush can again, cause breakage and damage such as split ends. A soft brush is more gentle on the hair. 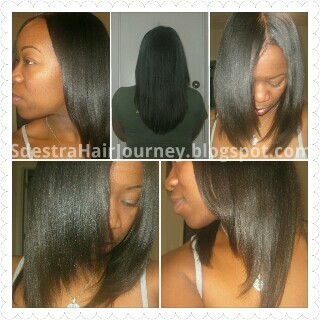 Relaxer Stretching - I already have a blog post and video about my relaxer stretching routine along with the benefits. 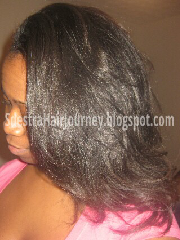 What a relaxer does, it alters the hair structure of the hair where some of its' properties are lost. If you are constantly relaxing your NG (new growth) every 4 weeks, you don't have enough of it to see in order to relax. Therefore, you are subjected to overlapping which will cause weak and over processed hair. Using a Wide Tooth Comb - Using a fine tooth comb will snag your hair and pull. A wise tooth comb will separate the hair more gently. If you do use a fine tooth comb, use a wide tooth comb first to remove the bulk of the tangles that you may have. Combing from ends to scalp (roots) - This technique saved many of us from so much grief and saved us so much more hair! If you start combing from the top and bring it down, the tangles within will compress onto one another, create more tangles and knotting will occur. Starting from the bottom will remove the tangles almost effortlessly as you work your way up. Detangle with conditioner - In this detangling video, I share how easy it is to manage my hair after being in a style that caused a matted mess. I use an inexpensive conditioner such as VO5 and finger detangle away prior to washing my hair. This techniques has also worked wonders on my daughter's natural hair too. Moisturize - I moisturize my hair ends and edges very often, almost every day. I use oil with my shampoos and conditioners when I was and/or deep condition. When I prepoo, I oil my scalp and it provides adequate moisture that will lessen the amount of dryness. Satin Scarf - I sleep with one 95% of the time. Honestly, the other times are because of laziness... We are all human :-)! Patience with your hair - I can not emphasize this enough! If you are not patient, you can do more damage to your hair. Frustration bring a slew of things such as pulling, ripping and using tools incorrectly thinking they will provide faster results. Allow enough time to style your hair, come up with ideas for your hair and/or find style or technique that makes it easier to do and change to the next. Low Heat - It is good to see how much heat your hair can handle...but when using heat tools, start with a medium setting and use heat protector AT ALL TIMES! With a blow dryer, I allow my hair to dry to about 75% or more and then blow dry. Please note, do not use flat or curling irons on wet hair. Protein treatments - This is to reinforce strength to the hair. When your hair has been exposed to many elements or if you have reached to a point where you neglected your hair, this is a good way to go. Another thing I want to add; if your hair happens to be weak prior to an expected relaxer treatment, a protein treatment is a good way to put in the strength into your hair atleast a week prior. Exercise, proper diet, water and mental health - Exercise as simple as walking can get your blood circulating throughout the body. And remember that blood carries nutrients along with oxygen to give your vital organs what it needs to function. Proper diet has to do with healthy eating such as more vegetables, fruits and different ways to cook the foods you love to eat. Water is definitely essential. Since water provides oxygen throughout your body, it also helps cleanse it too. Not only for your hair, but for your body as a whole. And mental health, I added this here because a lot of us go through a lot of stress. Whatever goes on in the inside always reflects on the outside sooner or later. When I say stress, I mean our life style, things that may be depressing and consume us. Find some time for a mental break...devotion, reading, exercising, spending time with loved ones, a day trip...anything that will calm your mind from a few hours to a day. We need to be healthy all around, not just our hair too. I hope this information benefits some or all...also check out My Hair Regimen for questions you may have. Feel free to ask questions add what has helped you....I love to learn new things! And as always, God bless! 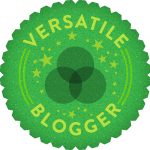 I Was Nominated for a Versatile Blogger Award! I want to thank these three wonderful ladies for nominating me for the Versatile Blogger Award! I am relatively new to blogging and I appreciate the love I have received so far. These lovely ladies, Southern Girl of Pecan Pie and Pin Curls, Darrolyn Evans of The Wondrous World of Parenting and Emprezz of GhanaianEmprezz nominated me. I want to thank each and every one of them for even following my blog! Take the time to check them out too! 1. First and foremost I love God! 2. My family is from Haiti and I am so proud of my heritage and culture! 3. I praise God for allowing my 3 children (Daughter, Son and Husband) to drive me crazy otherwise, I'd be worried! 7. I took a Japanese course in highschool for 2 years, I can have a small conversation and can write in two forms, Hiragana and Katakana. The 15 Nominees I have chosen and check them out too! Mrs. Michelle Obama's speech during the Democratic National Convention in Charlotte, NC last night was beautiful and eloquently stated. Her speech was from the heart, sincere, relatable and down to earth. She was a woman that expressed the values that a lot of us focus on, which is family, sacrifices, how a character is revealed in a position and of unconditional love. No matter what your political views are, we must say that she talked about her husband as many proud wives would. She had such pride, dignity and effortlessly spoke about President Obama's positive morals and ethics. On that note, Mrs. Ann Romney did the same respectively and in many ways expressed things about her husband that made her proud of him too. I was overwhelmed with Michelle when she came out and before her speech because of her beauty! And when she spoke, I was awed by everything...from pouring her soul about her husband to her whole look and vibe! 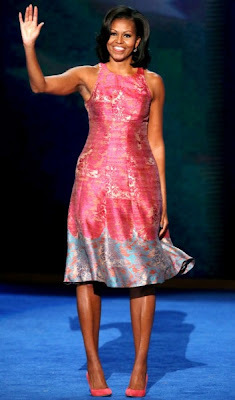 We all were mesmerized with Mrs. Obama's arms that is always the buzz....her body is toned and she is very fit. Being healthy is extremely important...you feel good inside and out. Eating right and exercising will provide an array of benefits, such as looking young, energetic, beautiful skin, hair and still have a functioning brain. Seeing her looking as amazing as she always does, her messages on health, fitness, empowerment and combating child obesity should be a motivation for us all...so what are our excuses for not taking the steps to becoming healthy? Okay, so I can not stay away from this part! Her hair was absolutely gorgeous, shiny and healthy looking. And I will say one thing, and something I have always said for a very long time: "Healthy hair will always turn heads no matter what length it is." And hers sure did! In my opinion, the FLOTUS was on point from heart to soul and head to toe! No matter of your political views she is definitely a positive role model for us and our young women growing up in this generation.